Haglund’s deformity is a symptomatic osseous prominence of the posterolateral corner of the calcaneus resulting in posterior heel pain and swelling around the insertion of the Achilles tendon. It is associated with retrocalcaneal bursitis. Cavo varus deformities exacerbate this problem. It was first described by Patrick Haglund as early as 1928. Prior to that other descriptions were used, such as “pump bump” (because the rigid backs of pump-style shoes can create pressure that aggravates the posterior heel pain and swelling), and "winter heel". The Achilles tendon originates from the aponeurosis of the gastrocnemius and soleus muscles. It inserts into the middle third of the posterior surface of the calcaneus. 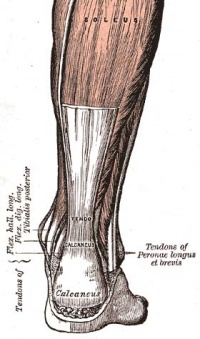 There are two bursae near the Achilles tendon - the deep retrocaneal bursa, and the o superficial bursa. These can be the sites of inflammation processes or can develop bursitis - non-inflammatory, inflammatory suppurative or calcified retrocalcaneal. Hugland's Deformity are most common in the female population between the ages of 15 and 35, especially in woman who regularly wear heels. It is also common in runners. Genetics (hereditary): Patients can have a bone structure that makes them prone to developing Haglund’s deformity. High foot arches: With high arches, the heel is tilted backward into the Achilles tendon (due to the insertion on the calcaneus). A bony protrusion develops and the bursa becomes inflamed due to the constant irritation of the back of the heel bone to rub against the tendon. Tight Achilles tendon: Pain is caused by compressing the tender and the inflamed bursa. Tendency to walk on the outside of the heel: This produces wear on the outer edge of the sole of the shoe which will rotate the heel inward. This will result in a grinding of the calcaneus against the tendon; a bursa will form, which will eventually becomes inflamed and tender. Improper/tight shoes: Does not counter the bump but cause symptoms and which maybe lead to bursitis. The friction between the soft tissue at the back of the heel and the shoe, can cause the bursae can become inflamed. Symptoms are aggravated by wearing footwear with hard heel edges, as this impinge on the bursa and the Achilles tendon on the calcaneas. Conservative management of Hugland's deformity used to relieve the associated symptoms, but are not able to resolve the problem. Anti-inflammatory medication are recommended for pain relief, but corticosteriod injections are best avoided, as it can lead to rupture of the Achilles tendon. Physiotherapists can play a big role in the conservative management of Hugland's Deformity, especially with the management of the bursitis associated with this deformity. Also see the pages for Achilles tendinosis and retrocacaneal bursitis for more information on the management thereof. It is important to take the risks of Achilles tendon rupture and injury after removal of the bony protrusion into consideration when managing these patients post-operatively. Full rehabilitation after Haglund's resection can take up to one year. Return to full activity at 6 weeks post-surgery. Hugland's deformity is a bony protrusion on the posterolateral part of the heel. It occurs mostly in young females. Friction with incorrect foot ware or biomechanics cause bursitis, and patients will often complain of pain and swelling at the back of the heel. Conservative management includes management of the inflammation, modification of aggravating factors and an eccentric training programme. Surgical management consists of partial or full removal of the bony protrusion, but risks include injury or rupture of the Achilles tendon. A closing wedge calcaneal osteotomy can also be done. ↑ 1.0 1.1 1.2 1.3 Alfredson H, Cook J, Silbernagel K, Karlsson J. Pain in the Achilles region. In: Brukner P, Bahr R, Blair S, Cook J, Crossley K, McConnell J, McCrory P, Noakes T, Khan K. Clinical Sports Medicine: 4th edition. Sydney: McGraw-Hill. p.795-797. ↑ Jung H, Carag JA, Park J, Bae E, Lim S, Kim H. Osteochondroma of the calcaneus presenting as Haglund’s deformity. Foot and Ankle Surgery 2010;17:20–22. ↑ 3.0 3.1 Stephens MM. Haglund's deformity and retrocalcaneal bursitis. The Orthopedic clinics of North America 1994;25(1):41-6. ↑ Haglund P. Beitrag zur uliwik der Achilesse have. Z Orthop Chir 1928;49. ↑ Myerson MS, Mandelbaum B. Disorders of the Achilles tendon and the retrocalcaneal region. Foot and ankle disorders. Philadelphia: WB Saunders. 2000:1382-98. ↑ 6.0 6.1 6.2 6.3 6.4 Lesic A, Bumbasirevic M. Disorders of the Achilles tendon. Current Orthopaedics 2004;18(1):63-75. ↑ Kolodziej P, Glisson RR, Nunley JA. Risk of avulsion of the Achilles tendon after partial excision for treatment of insertional tendonitis and Haglund's deformity: a biomechanical study. Foot & ankle international 1999;20(7):433-7. ↑ Boffeli TJ, Peterson MC. The Keck and Kelly wedge calcaneal osteotomy for Haglund's deformity: a technique for reproducible results. The Journal of Foot and Ankle Surgery 2012;51(3):398-401. ↑ 9.0 9.1 American Orthopaedic Foot & Ankle Society. Haglund deformity. Available from: http://www.aofas.org/PRC/conditions/Pages/Conditions/Haglund-Deformity.aspx (accessed 06/01/2019). ↑ American College of Foot and Ankle Surgeons. Haglund's deformity. Available from: http://www.oregonmedicalgroup.com/wp-content/uploads/2015/07/1f43c091d17ec4f2d9902a5687e39819.pdf (accessed 09/01/2019). ↑ Midwest bone & joint institute. Haglund's deformity of the foot. Available from: https://midwestbonejoint.com/foot/haglunds-deformity-of-the-foot/ (accessed 09/01/2019). ↑ Healthline. Haglund's deformity. Available from: https://www.healthline.com/health/haglund-deformity (accessed 09/01/2019). ↑ 13.0 13.1 13.2 13.3 Medical College of Wisconsin. Haglund's resection. Available from: https://www.mcw.edu/-/media/MCW/Departments/Orthopaedic-Surgery/hagland.pdf?la=en (accessed 14/01/2019).